Before heading to the Cressance fashion show, which took place in one of Luxembourg's most elegant buildings, I popped in the casual Thomas Sabo event at a jewellery shop. As it had been raining all week I decided to wear black trousers and boots, and as I was totally uninspired for my outfit anyway I added a black blouse and a denim jacket. During the Thomas Sabo event I started pondering about the choice of my outfit, but I got downright worried when I saw the doormen in their elegant suits at the entrance of the Cressance fashion show. I was overly happy to find a cloak room so I could quickly get rid of my vintage denim jacket. The amazing crystal chandeliers in the building didn't make me feel any more comfortable. When I finally saw the other guests, all clad in their most elegant dresses and jumpsuits, topped off with high heels and clutches, I ultimately realised that this was not a fashion week style show but a Luxembourg elite soirée. I don't think I've ever been that happy to wear all black, which made my outfit appear a little less misplaced and little more expensive. My 20€ H&M jeans did indeed not make me look like the daughter of a minister, and so I spent the whole evening making myself scarce. The fact that I had gone to this event alone didn't make it any better, so I preferred to stand alone in the hallway instead of sitting in a room with people who've been watching me like a straying dog. In the end I was saved by an elderly Belgian man who came up to me with the words: 'You seem to be just as deserted as me.' All in all the evening wasn't a failure but rather a lesson. And as I want you to learn from my mistakes, I decided to compile a list of the tips that I actually know about dressing appropriately but that I sometimes ignore for the sake of dressing comfortably. The location says a lot about the dress code. An event at the beach requires other clothes than an event in a ball room. If you've never been at the location of an event, you can easily check out the usual atmosphere online or on Instagram. If you know the host of a party it's always a safe bet to ask him/her what kind of outfit they have in mind for their event. In the case of a wedding for example, you can learn a lot about the dress code by asking the bride about her wedding dress. If it's a princessy dream gown you can be sure that the bride expects you to wear a long gown as well. When I get an invitation for an event I'm super excited about, I often read it too quickly and forget about the exact words. However the invitation may either contain the dress code, or you'll be able to recognise the style of the event with the help of the formulations. A formal invitation on expensive paper that addresses you as Ms will surely lead to a formal event that requires a more elegant look. 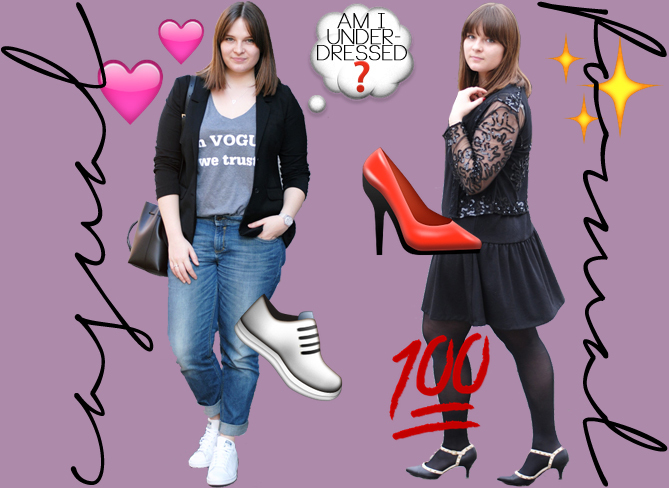 It's a common thing among bloggers to ask what others will be wearing to an upcoming event. I surely have been discussing the question 'dress or jeans' more than once in my life. In the end it's always good to know what your friends will be wearing, so you can be sure you won't be the only one who's under- oder overdressed. In the case of my fashion show I should have known that only well dressed people will show up, as the event was followed by an expensive dinner. So always ask yourself what kind of people will go to this event. If it's something you have to pay for you can be almost sure that people will put more effort in their outfits than otherwise. Speaking for bloggers it's always good to know a bit about the brand who invited you to an event. The dress code at an H&M store opening will be different than at Dior store opening, already because the salesladies dress differently. I've been to events at about any time of the day and it's pretty clear that the later it gets, the more effort you should put in your outfit (and makeup). It's not for nothing that dinner sounds more elegant than lunch. If you know almost nothing about the event you can always play it safe with classics. I don't share the opinion that you can never go wrong with a little black dress, but I believe in the power of clothes that women have been wearing for decades, like a white blouse, pumps or pencil skirts. Shoes can really make or break an outfit. Even jeans and a shirt can look elegant if you wear them with a good pair of high heels. The same goes for bags (talking about totes versus clutches) or jackets (talking about cardigans versus blazers). So if you regularly head to an event right after work, it's always good to have your party shoes standing ready under your desk. Despite all these tips it can still happen that you end up over- or underdressed at an event (because there will always be boring family members just like there will always be tarted up divas). However you shouldn't worry to much about it. Simply grab a glass of champagne and have fun.